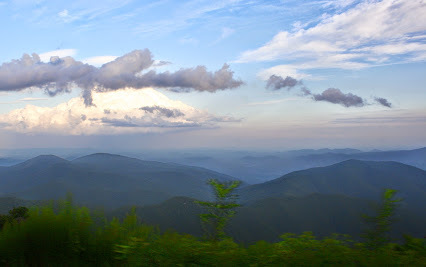 The North Carolina western mountains contain pockets of earth that hold emeralds, sapphires and moonstones. Close to these mines are several small towns which are treasures unto themselves. One such location is Celo (pronounced See-lo), North Carolina, which includes Celo Community and Celo Inn. Celo Community, established in 1937 by Arthur Ernest Morgan, is a communal area of 1,200 acres where forty families reside today. Largely Quaker in the early years, there is no particular theology followed now; instead, the organization’s purpose is “to provide an opportunity for its members to enjoy a life that includes personal expression, neighborly friendship and cooperation, and appreciative care of the natural environment.” It operates as a land trust system where the families can build homes, but never own the land. In 1971 Charles and Susannah Jones begin building their home which later became the Celo Inn. They used old materials when possible: Civil War-era bricks and shingles from a demolished rest home in Asheville. The flashed patina bricks for the foundation came from General Shale in Kingsport, TN. The kitchen equipment came from Knoxville’s 1982 World Fair after it closed. The worst flood in modern times in the area occurred in 1977 halfway through construction.. The entire property flooded with water, at one time reaching the roof of the accompanying cottage. Neighbors came together to restore the destroyed work, and finally, after 10 years the Jones completed this comfortable and picturesque inn where they lived and hosted many visitors. When they relocated, a couple who had been filling in for them at vacation time took over Celo Inn. Nancy and Randy Raskin have lived there since 1987. There are five bedrooms in the upstairs of the Inn. 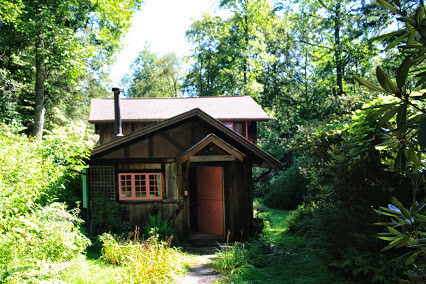 The cottage’s two bedrooms can accomodate five people. 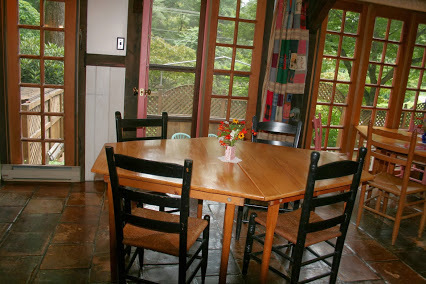 The main Inn has a large dining room, filled with natural light on sunshiny days making the handcrafted wood details visible. Breakfast is the only meal served, seven days a week, for around $7. You choose from a menu the night before, and Nancy offers a variety each day. Breakfast room at Celo Inn. Nancy came over to say they discouraged electronic devices in the dining room. Finding the Inn can be a challenge as they don’t advertise with signage except right at the turn off the main road. The dark planking building is immediately visible with a small parking lot at the edge of the road. 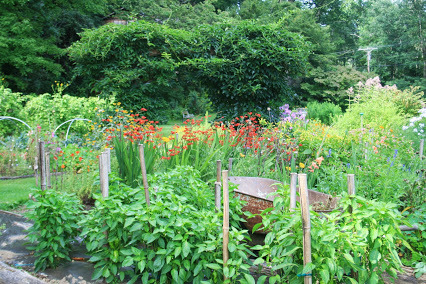 Colorful flowers combined with the vegetable gardens and a small brook add charm to the grounds. 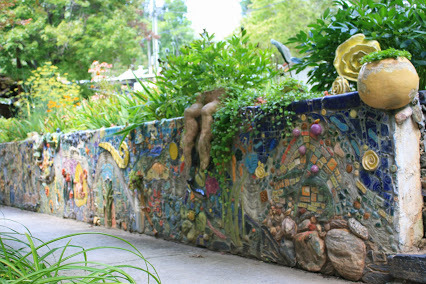 One of the gardens at Celo Inn. The South Toe River runs beside the property and can be reached easily to cool feet after a hike. The river’s deeper areas can accomodate swimming, tubing, and fishing. We stayed in the cottage which is connected to the Inn by a gravel pathway. It is comfortable with an equipped kitchen, two bedrooms, a living room, and bathroom. We loved the big Dutch front and back doors, but were left instructions to watch for Jackson, the outside cat, who might try to visit. The Cottage at the Celo Inn. One pleasure we noticed almost immediately is the quiet. There is no loud music playing, no televisions in the rooms. Internet service is spotty. At breakfast one morning a member of our group was checking her phone for messages and Nancy came over to say they discouraged electronic devices in the dining room. Children of the well behaved variety are welcome. 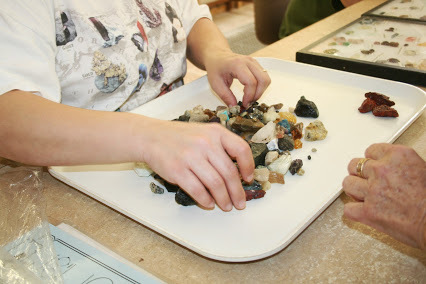 A visit to one of the gem mines is a fun outing. We visited The Emerald Village in Little Switzerland, NC. You can purchase a bucket to sift through at the flume, just like the miners of old. Pick out what you want to keep and one of the employees will tell you if it is treasure or trash. Also worth visiting is Little Switzerland’s Books & Beans . 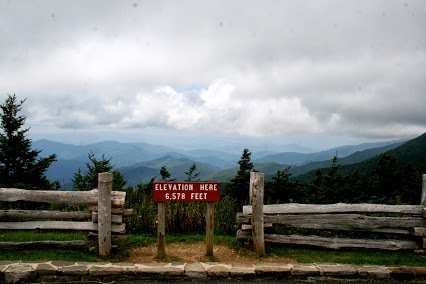 Mount Mitchell State Park, home of the highest peak in the United States east of the Mississippi, is located within an hour’s drive of Celo. Mt. Mitchell is 6,684 feet high at its summit. There are trails to walk and a restaurant at the top. View from the top of Mount Mitchell. 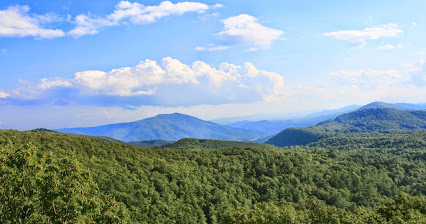 The Blue Ridge Parkway runs through this area with gorgeous overviews. Remember it is two lane and the maximum speed limit is 45 mph. Take a picnic to enjoy at one of the stops. Don’t forget your camera! View from Blue Ridge Parkway. 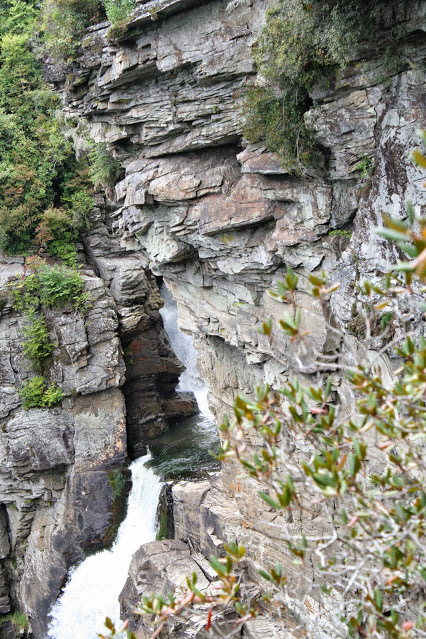 Linville Falls is one of the most visited waterfalls in North Carolina. There is a gift shop and restrooms at the Visitors Center and hiking trails, ranging from easy to moderate. The walk to the falls is about 1.5 miles round trip. 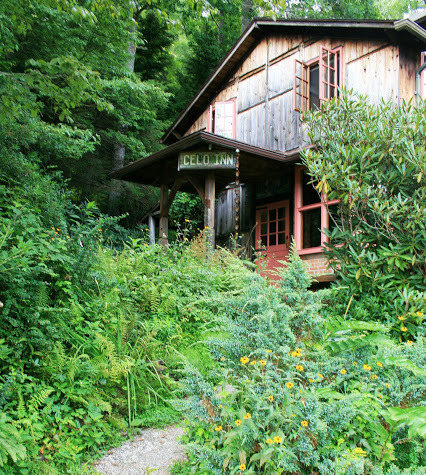 Penland School of Crafts has a beautiful campus where 1,200 students come each year to learn crafting skills ranging from welding to pottery. There is a gallery with lovely gifts for sale. If you are visiting during class time you can observe from a doorway or through windows. 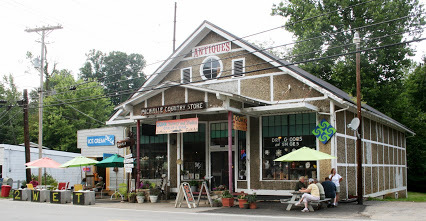 Micaville, NC, is just minutes away from Celo Inn and seems to consist of a post office, a fine craft general store, and some of the best ice cream you can find. Blueberry kale is the big favorite this summer. Make it a priority to explore the Celo Community. Near the Inn is an unpaved road that is shaded and gives visitors a clear look at the homes, gardens, school and camp located there. The river runs beside the road with good swimming areas for children. Celo is about 2½ hours from Knoxville. It is accessed off I-26. Be sure to study the best route from you location. Those mountain roads are curvy and slow, but the treasure at the end makes the journey worthwhile. Read Judy S. Blackstock’s other travel articles: Backbone Rock, Home to the World’s Smallest Tunnel (VA) and Wheatland Plantation (TN).